Sometimes even the most well-mannered feline may suddenly turn into a little tiger and bite or claw you. It’s ok to relieve your feelings with some choice words, but after calming down you need to understand why your cuddly pet turned into an aggressive cat. Here are five reasons for cat aggression. You’re enjoying a petting session when suddenly your hand is grabbed by claws and teeth. Not a full-powered attack to break the skin, just a message saying: “Stop, I’ve had enough!” Most aggressive cats will let go if you freeze. Don’t fight back – you may get a real bite! If freezing doesn’t work, try startling the cat by smacking your other hand against the sofa to make a noise. Many cats enjoy belly rubs and will roll over on to their backs as if to say: “Please rub my belly.” However, “I’ve had enough” attacks often come from petting a cat’s belly. The cat belly is a very sensitive area and also has sexual connotations, so you need to learn just how far you can go. A male cat may become aroused when having his lower belly rubbed and instinctively react with a bite because that’s what cat mating behavior involves. A kitten or young cat who pounces on your foot and then bounces off the wall isn’t trying to hurt you – he’s just having fun. Take his mind off your body parts by enticing him with a toy, such as a cat fishing pole or a mouse on a string. Deter play attacks on you by giving him a spray of water or a blast from an air horn. Your cat is enraged when he spies another cat on the deck outside your window. You walk by, and he nails you. Don’t take it personally – he’s just taking out his frustrated cat aggression on you. 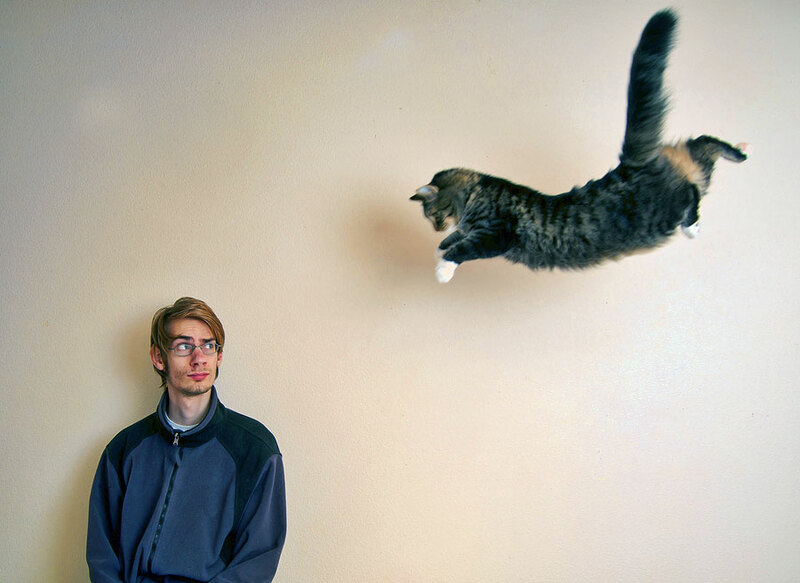 Try to discourage the visiting cat – thump on the window or put the air horn out the door and give the visitor a blast. A cat in pain or fear will adopt a defensive, low-to-the-ground posture. His ears will be flattened against his head, and his claws will be unfurled. The cat’s body message is clearly saying: “Don’t come near me!” If something has scared your cat, just leave him be until he has relaxed. If you think your cat is in pain, then take him to the vet. Pay attention to your cat to learn when you’ve gone too far with petting or trying to clip his claws. Aggressive cat attacks don’t come out of the blue. A cat will warn you when he’s had enough – watch the twitching tail. Sometimes a cat will make growling noises, for instance, if you are trying to get knots out of his long coat. If your cat is striking out regularly, he may be hurting, so take him to the vet for a checkup. The vets at CVETS are trained to deal with aggressive cats so don’t worry about us getting hurt. We’ll take a look at your pet and determine where he is hurting and why. Our goal is to send you home with a calm cat who will stay that way. Previous PostYour Pet Has an Abscess. Now what? Next PostWhat Do I Do When My Dog is Constipated?